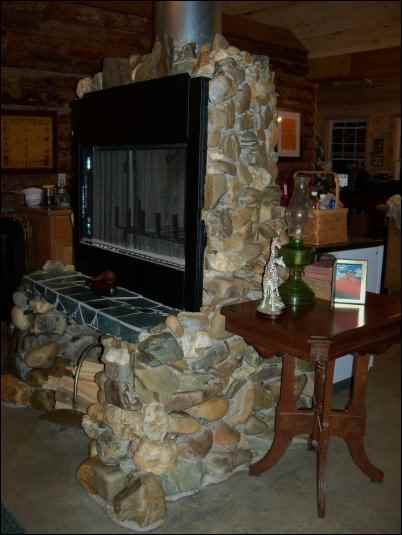 Nothing says “log cabin in the pines” like a big solid natural stone fireplace, so when we built our log cabin in the pines, that’s what we wanted. Now, we didn’t build the cabin ourselves; we “cheated” and had the log home company’s crew come in and put up the completed shell (foundation poured with stubbed-in plumbing, logs erected with wiring inside, windows and doors installed, porches built and roof on) in the time it would’ve taken US to sort out the logs and lay the first course. Maybe. And the dangerous high-off-of-the-ground and/or needing-power-tools stuff we had our contractor friend do, but the REST of the stuff? All us, baby. And one of the things I looked forward to doing most was placing the stone fireplace in the center of the house—the only thing that separates the living room from the kitchen and dining rooms. 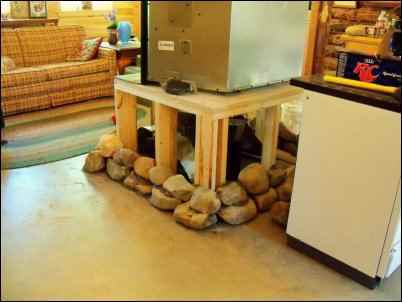 In my mind’s eye, I see the fireplace in the log lodge at Girl Scout camp: native stones stacked by campers, not masons. It was lopsided. It was free form. It was perfect. That fireplace, with the hand-carved sign on the mantel that told 100 years’ worth of campers, “Chop your own wood—it’ll warm you twice”, was the absolute focal point of an entire end of the lodge, and warm us it did, without effort, in Wisconsin winters. And there lay the only hitch of the plan: we’re not in Wisconsin anymore, Dorothy. We’re in Texas, and although winters can get nippy, and last winter downright frigid with temperatures in the teens at night and mere 20’s during the day for over a week (don’t giggle, Yankees, that’s serious stuff when nothing is built to function in that mess), but for the most part, the rock fireplace in my head, even scaled back by half to accommodate the vastly smaller area of our cabin vs. the lodge was way, way, WAY too big. The vision of my home spontaneously combusting from the sheer radiant heat of the rocks sort of dimmed the enjoyment of the rest of the picture for me. “Well, guess that’s it then; no fireplace in the center of the house”, said the little man with the computer program that makes blueprints. Fool. Ronnie had a plan. Ronnie is the contractor and not afraid to think outside the box. In this case, what we needed WAS a box. Here’s what we did. We started with a box: a big wooden box frame that’s 4′ x 2′ x 2′ high. Yes, that high. I’ve spent the majority of my life kneeling before the Fire God and I’m just not into that aspect of it anymore. I want to be able to build and tend a fire without needing a winch to get my old bones back into the upright position. So the fireplace and both tiny wood-burning heaters are two feet off the ground. Ronnie said it was a good idea because they draw better that way, but I suspect he was just being nice to an old lady. Because I’d done tile work: I designed and tiled my kitchen counters and the showers and sink counters in the bathrooms along with the platforms the wood heaters stand on, but I’d never done anything in stone, much less something of this magnitude. Ronnie told me not to worry—it’s not like the finished product would be set in cement and sitting in the absolute center of my home for ever and ever and ever. 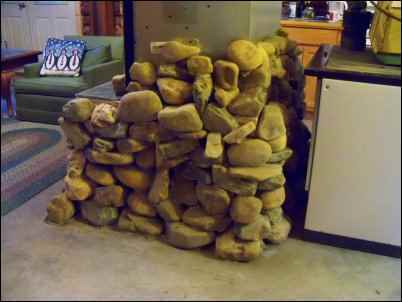 The fireplace installer told me the prettiest fireplace he’d ever seen was done by a man who invited all his grandkids over for the weekend and told them “Bring me rocks” and he laid them as they were brought in. 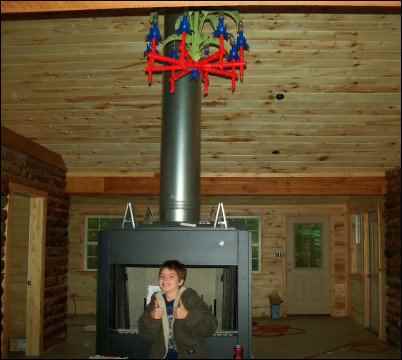 I remembered the anything-but-symmetrical fireplace in the lodge. My panic subsided and was replaced by, “I need a ton of rocks”. 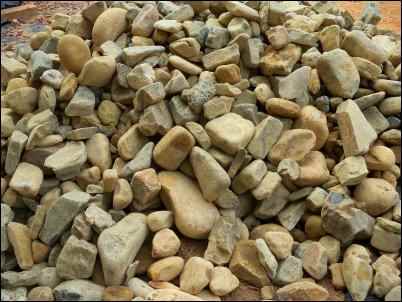 East Texas has rocks, but mostly of the iron-ore variety and not like other areas of the country where rocks are more abundant than topsoil, or sand, or clay, or air. So we went to the rock store, which also sells sod, and has the ginormous billboard out front proclaiming, “See us to buy grass and get stoned”. How could an ol’ hippiechick resist such a sales pitch? Out front were wire bins of washed rocks—beautiful uniform picture-perfect rocks. New England limestone, Austin field stone, Colorado river rocks, slates of all colors and hues cleaned up, sorted and ready to add the finishing touch to a perfect home. The average price was several hundred dollars a bin, and each bin was just shy of a ton in weight. I picked them up, hefted them in my hand, and tried to imagine them stacked in my home. But it didn’t feel right. I wandered to the back of the building where the bulk gravels and stones were unceremoniously dumped into cement block holding pits. And there they were: MY rocks. Oklahoma river rocks, varying in size officially from four to eight pounds but with a lot of little ones tucked into the mix and a few 20-plus pounders. All different shapes and sizes, all different colors and materials, almost exactly zero percent perfect and unmarred. I said, “I’ll take these; how much tonnage do you think is right here and how much including delivery?” The man said, “Oh, about four tons. With delivery to your place 30 miles from here? $300”. And my rocks came home. We’re told that so many things in life can only be done by “professionals”, and for certain things I agree—things like brain surgery, or building a rocket ship or really excellent tattoo work do require professional training. But the average Joe or Jane can do a large number of things with enough patience, attention to detail and sense of humor. One of my inspirations is a book entitled Stone by Design: The Artistry of Lew French. Not only because Lew’s work is beautiful and mostly not symmetrically stacked and conventionally grouted, but because Lew was not “professionally” trained. So armed with four tons of river rock, a fireplace insert on a wooden box stand and the support of my family, who foolishly believe I can do anything—I started my rock work. I started out with the tools of the trade I’d been told to purchase: bags of mortar (deceivingly heavy) and 2 mortar trowels—a big one for mixing and a small one for laying the mortar. I already had the 5-gallon bucket and water. First lesson of rock work: you need mortar, water, a SMALL bucket or pan for the cement, a large pointy stick and your hands. The large trowel was cumbersome and didn’t do a good job (for me) getting into the corners of the bucket, but the pointy stick was perfect. The small trowel was okay for the first few layers when the rocks were pretty level and uniform, but lost any usefulness once the going got… unconventional. Far easier to scoop up the little bit I needed with my hand and plop it where it was needed. Because this is not quick work- the rocks need to be set just right and I didn’t want big ‘ol mortar lines running all through it, I wanted to use just enough mortar to hold the stones together, so they’d look more “stacked” than “glued”. Considering the patience needed and time to figure out which rock was going where, a 5-gallon bucket was wildly too big (and also too honkin’ heavy; ROCKS are heavy enough). I used a shoebox-sized tote and that was just about right. Second lesson of rock work: your first attempt at rock work you’ll need more mortar than you think because your “eye” isn’t finessed yet and truth is, they WILL need to be glued together. It’s OK, though, your finished product should still draw attention to the rocks first, the mortar second. So I mixed the mortar and it took a while to get it just right—you want it wet enough so it doesn’t crumble, but dry enough to not run down the sides of the rocks like the Gravel Monster had intestinal distress. Working with this medium is surprisingly forgiving; if the rocks don’t “take” or stick to the mortar and thence to each other, it’s a simple (but oh so maddening and frustrating) fix to brush off the dry mortar and try again. And sometimes again. And again. With the exception of that very first row of rocks needing only one flat bottom side (which made it the quickest and easiest row, but the fact that I used the biggest rocks on the bottom made up for that), each and every rock needs to be placed there “dry” without mortar. If it sets on its own accord, you’re golden. If it wobbles even just a tiny bit, put it aside and try another one EVEN IF IT LOOKS PERFECT FOR THAT SPOT. I’m telling you truly—yea verily—the rocks will only go together when and how they choose, and I can show you the one rock I mortared SIX times—it and the rock below it fit so tight you couldn’t slide a molecule between them but they never ever locked with mortar. Ever. Cold day, hot day, wetting both surfaces first, putting another rock on top to weigh them down… it still tipped right off the next day. I found a different rock and it “took” on the first try. The offending non-sticker? Set perfectly solid somewhere else before the mortar was dry. So you’re carting in stones, mixing mortar and literally rockin’ along. I tried not to do more than three layers a day, just in case I had to re-set a stone, but you may be braver than I am. Remember to use big rocks at the bottom, graduating up to smaller rocks at the top. I used some marble pieces that were gifted to me as the hearth surface, and did it just like tile work, adhesive followed by grout. It looks and works great—just like tile. When I got to the smaller rocks on the fireplace, I thought “Hey, the adhesive says it can be used for rocks, I’ll just use a dab of adhesive instead of mortar” since I was a little worried that the smaller rocks would get lost or buried in the mortar needed to set them in place. Don’t do it. Seriously. I finished setting about 65 little rocks at 1:00 a.m. and went to bed smiling and smug. At 6:30 in the morning I was mixing mortar and teaching my son a whole new set of vocabulary words. Mortar is pretty forgiving, but if you make a batch too dry or too wet, don’t think it’ll be OK and use it anyway. It won’t. I tested that theory out many many times…ya know, for scientific purposes. Wet the rock you are setting on and the rock being set to help binding; not drippy wet, just dampened with a wrung-out washrag. I learned that little trick by reading the directions on the mortar bag… 3/4 of the way through the project. Assess the rocks you’re building on and bring in the rocks you think will fit, then bring in twice again some that “might work”. Dollars to doughnuts those are the ones you’ll use up. Step back with every rock you set; twice I worked myself into a corner, once by the rocks following their natural ‘lean’ and cutting in beyond the outward edge of the box, and once using rocks too narrow on the top to leave a ‘shelf’ for the next one. My original plan was to set the big rocks on the bottom few layers, then medium rocks to the top, then flat/light rocks on the top and one layer up the pipe in a staggered fashion. Even from the git-go I knew I was NOT going to be perched on a ladder with an armload of rocks and a pail of mortar to the height of 14 feet (the center peak of the ceiling). Then I would fill in the gaps with smaller and smaller rocks till it appeared as a solid mass. I stacked the big rocks. I stacked the medium rocks. I placed the top rocks. I filled in the largest gaps with small rocks…and stood back to really study the project. 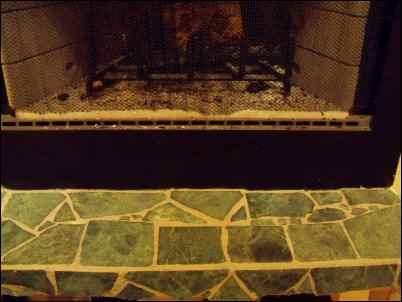 The fireplace sprouted out of the sealed (but not stained) cement floor in a tangled vine of rocks mostly covering the wood frame of the box and metal of the insert. Just here and there you could see a tiny bit of daylight peeping through on the bottom and a tiny bit of silver flashed in between the stones on the top. Even so, it looked strong and massive and so much like the fireplace I remember at the lodge it caught my breath and held it captive—the echoes of camp life ringing in my ears. On either side, the interior walls of our home steadfastly proclaim what they are: logs. Logs with the bark still attached verifying that yes, this home is made of trees. Our walls are logs that are true to their tree-ness. Our floor is cement that’s unstained and beautiful shades of gray. Our tiles are ceramic and our bathroom ceilings are tin. Everything in the house is real, and simple, and true. And suddenly the entire concept of making it “appear” as something its not just didn’t seem right anymore. The fireplace is rock; real rock that’s protecting and shielding the wood box and insert underneath, curled around them dragon-like and solid… enough. I washed and put away the mortar tools one last time. I sealed it with one coat of low-luster garage floor sealer—the same thing we’d used on the cement floor and it’s not shiny—it’s not supposed to be. The rocks have a quiet glow about them that brings out the color and character of each one. 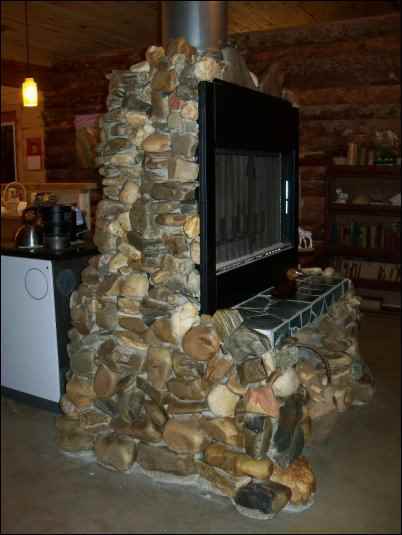 You are using the rocks as the actual fireplace. That would require much more skill and attention to the type of rocks used, as some don’t like being overheated and crack. Or explode. Both bad for the integrity of your fireplace and safety of your family. You don’t use a super-insulated insert. You need everything to match, line up and look “just so”. If that’s the case, I recommend you not even step foot onto my property. 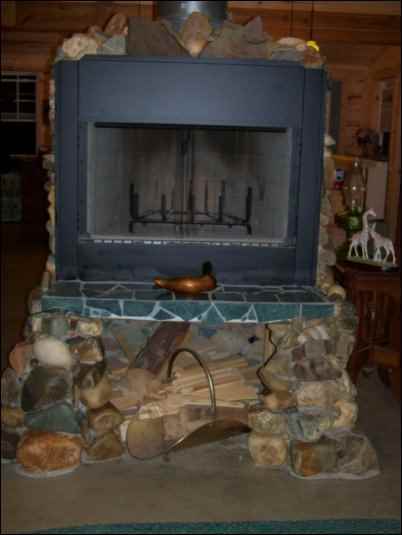 In my mind’s eye I still see the fireplace in the log lodge at Girl Scout camp, and I always will. But now I see in front of me, and instinctively reach out and touch OUR fireplace—native stones stacked by myself, not masons. It’s a little lopsided. It’s completely free form.